The 6-year-old took home Grand Champion in the Holstein Show. The Grand Champion is chosen! During the Six-Year-Old and Older Cow Class the collective Coliseum audience held their breath as Judge Carl Phoenix motioned for the cow in first to pull to a stop and the cow in second to pull side-by-side. At that moment, the cow in second was Jacobs Lauthority Loana exhibited by Ferme Jacobs and Pat Conroy of Cap-Sante, Quebec, Canada. Phoenix took another look and tapped Loana ahead to first place in the class and that’s where she stayed the rest of the day. 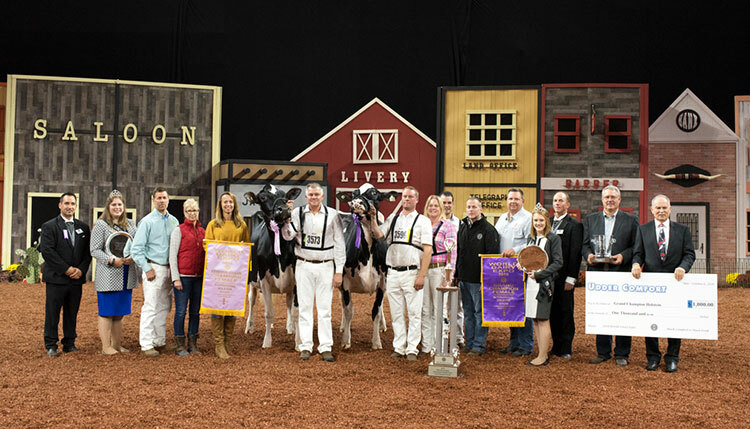 Loana, an Excellent-96 point cow, was just getting started as she was next paraded across the colored shavings to earn the title Champion Bred and Owned. 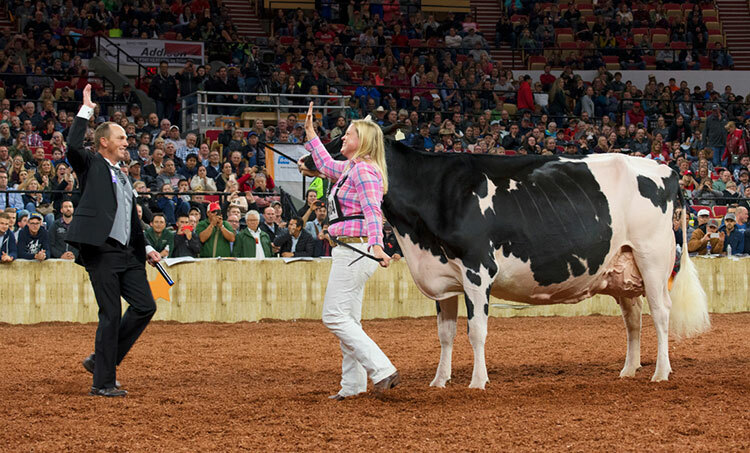 Following that she was named Senior Champion with Weeks Dundee Anika, the cow she beat in the Six-Year-Old and Older Cow Class, was named Reserve Senior Champion and Reserve Grand Champion of the Holstein Show. She was exhibited by Milksource Genetics LLC of Kaukauna, Wis.
Intermediate Champion was Erbacres Snapple Shakira-ET exhibited by Ferme Jacobs, Ty-D Holsteins, Kilian Theraulaz, Ferme Antelimarck, C&F Jacobs of Cap-Sante, Quebec, Canada who was the winning junior 3-year-old. The Reserve Intermediate Champion was Unique Dempsey Cheers exhibited by Budjon, Abbott, Vail, Woodmansee & Ferme Blondin of Lomira, Wis. Junior Champion belonged to Milksource Taelyn-ET exhibited by Milksource Genetics LLC of Kaukauna, Wis. Jm Valley, Fortale, and JP Proulx of Amqui, Quebec, Canada took Reserve Junior Champion honors with the winning fall calf Garay Doorman Blind Date. The Premier Sire of the show was Braedale Goldwyn, while the Premier Sire of the heifer show was Val-Bisson Doorman-ET. For the second year in a row, Ferme Jacobs was the Premier Breeder. Milksource Genetics LLC was named the 2018 Premier Exhibitor.